A consistent sleep schedule isn’t just a physical need, but a mental and emotional one as well. Studies have shown that at a minimum we should be getting 7.5 hours of sleep each night. If you’re not getting enough sleep, start here to learn how to make the necessary adjustments. Autoimmunity lies at the root of many serious health conditions. While there are many things that can trigger autoimmune diseases, there are five culprits that are the most common. Let’s take a look at what causes autoimmunity, what symptoms might signal an autoimmune issue, and the kinds of tests are recommended so that you can take steps to reverse autoimmunity. The only way to resolve ongoing health issues is to look at the whole body and identify the underlying cause(s). This is where conventional medicine often falls short, focusing instead on specific areas of the body without considering their relationship to the whole. Let’s take a deeper look at how naturopathic medicine – and Dr. Doni’s approach in particular – can help you achieve and maintain health and wellness. 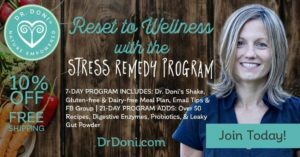 Dr. Doni was interviewed on Dr. Tyna Moore’s radio show, Pain Free and Strong Radio. They talked about adrenal dysfunction, and why it is the root cause in most hormonal issues. Taking good care of your bones involves more than just getting enough calcium. Dr. Doni gives an overview of how to promote good bone health throughout your life. It is never too late to start! What is peri-menopause and when does it start? What are the symptoms, and most importantly, what can you do about them? Dr. Doni covers how naturopathy can help support your body through this transition.